Summary: Oil painting of a scene at a port. 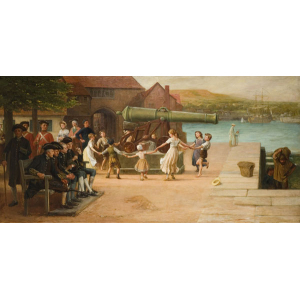 A group of children hold hands and dance around a cannon, while noblemen sit at a wooden bench. Hidden away two figures in red military jackets stand tall. Two figures climb the steps from the sea carrying their wares. In the distance two more figures look out at sea, perhaps at the boat that blends into the distant coastline.